Fadama Legal Assistance Program (FLAP) is a community operated legal service in the heart of Old Fadama for the people of Old Fadama. 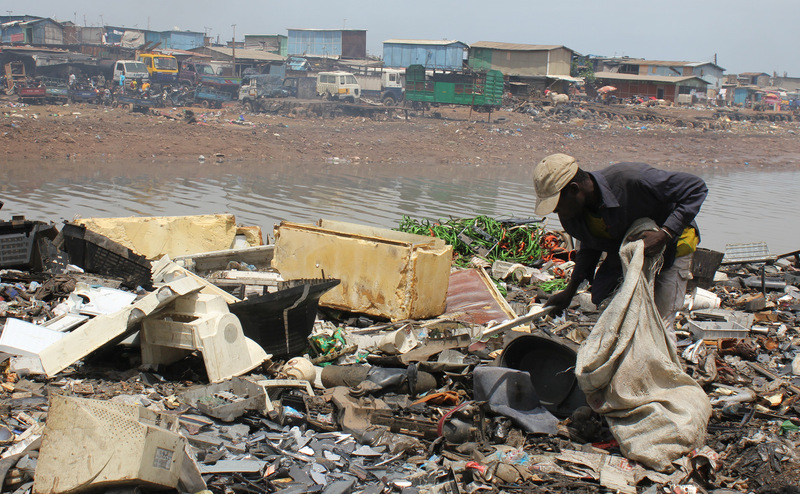 Old Fadama, also known as Agbogbloshie, is the largest slum in Ghana and is one of the biggest e-waste dumping grounds in the world. Home to more than 80,000 people, the slum, on four acres of land, is situated on the banks of the Korle Lagoon, a short distance from the centre of the nation’s capital, Accra. The lagoon has been cited as one of the most polluted bodies of water on the planet. enabling them to enforce their rights, resolve disputes, and pursue legal remedies, with minimal disruption to their capacity to earn an income, and without resort to violence. FLAP aims to be a friend to the residents of Old Fadama, and a link between the people of Old Fadama and the services to which they are entitled. Our centre is situated within Old Fadama in a location easily accessible for the local residents. It is open Monday to Friday during business hours, and is contactable via telephone at all other times, making it available 24 hours a day for advice at times of crisis. Our centre is a place for people to go when they have a problem, or they are not sure if they have a problem, and its services are available to Old Fadama residents free of charge. It is staffed by local residents who have been trained in taking instructions from clients, on the legal system and processes of Ghana, on relevant laws, on human rights, and in the art of mediation. These people are assisted by representatives of Legal Aid where necessary and by the International Advisory Committee. Old Fadama, covering four acres of land, is home to in excess of 80,000 people. It is distinguished from other slums around the world by its status as one of the largest e-waste dumping grounds in existence. Viewed by many Ghanaians as the home of moral degradation and crime, its inhabitants are characterised as illegitimate citizens, to be avoided, ignored, and, where possible, removed. In Accra, Old Fadama is known as ‘Sodom and Gomorrah’, a not-so-subtle indication in a brazenly religious country that the residents of Old Fadama are thought of as the dregs of society; as people who are innately bad. But to the people of Old Fadama, this crowded, dirty, and polluted settlement on the banks of the Korle Lagoon is the only home they know, and to the younger residents, it is the only home they have ever known. The community was established in 1989, when people began setting up shanty structures on the land after becoming displaced as a result of tribal fighting in the North of Ghana between the Dogomba and the Komkomba tribal groups. Over time, the resident population grew, as more and more people from all over Ghana began migrating to the capital in search of work and found they were unable to afford accommodation in any other parts of Accra. During the late 1990s, in a charitable bid to help bridge the technological divide between developed and developing nations, Western countries began delivering second-hand electronic goods to Old Fadama. Before, long, however, the scheme was corrupted and became an economically efficient method of disposing of the West’s useless digital waste. Today, an estimated 60% of the male residents of the slum, as well as children, spend their days wading through the trash in search of scraps and copper to sell. They dismantle the electronic goods with their bare hands and burn the plastics, emitting toxins into the air, land, and water within which the residents live and their children play. 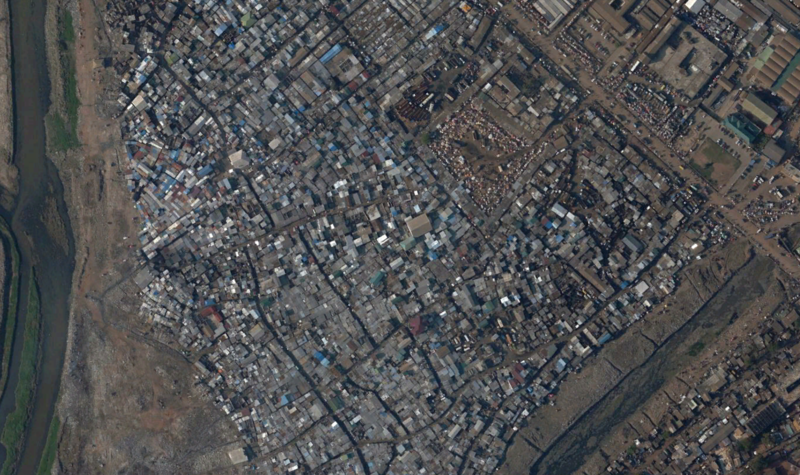 The landscape of the slum is littered with rubbish. The banks of the lagoon are piled high with electronic waste. The air is thick and filled with smoke generated by the burning of plastics. It has a chemically, rubbish-fuelled, odour and it makes outsiders feel sick. The ground is the colour of melted down lead. The whole area is a shambles. Old Fadama is a maze of shanty structures, seemingly thrown together with whatever materials were on hand and chaotically arranged with narrow pathways between them. Navigating the maze is a balancing act; and requires one to step around and over cast iron pots on coals, small children amusing themselves in the dirt, and puddles of stagnant, rubbish filled, silver water. Old Fadama, now home to sixteen different tribal groups, has been called a national disaster by Amnesty International. As the people of Old Fadama are, essentially, illegal squatters, there has been a strong push in recent years to forcefully evict the residents, who have nowhere else to go, and transform the area into recreational parkland. There is no sewerage, little electricity, no medical facilities, and very limited access to education. More than 65% of the residents have received no formal education, and have extremely limited capacity to earn income. More than 80% of the women in the slum, many of whom have children to support, survive on less than $2 per day, working primarily as Human Load Carriers, known as “Kayayie”. Fadama Legal Assistance Program was the dream of Frederick Opoku. Frederick has been a resident of Old Fadama for many years, and his surroundings inspired him to become the Founder and President of Women in Slums Economic Empowerment (WISEEP), the first non-profit organisation to be based in Old Fadama. An activist by nature, Frederick recognised the human rights violations that confronted him daily and he dreamed of bringing legal services to his community. In 2012, Amnesty International Ghana put Frederick in touch with the local Projects Abroad Human Rights Office (PAHO). 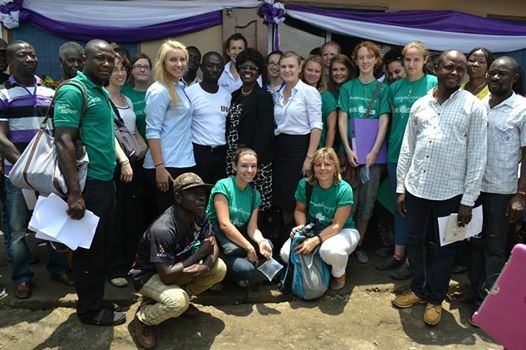 A partnership then formed between WISEEP and PAHO, through which international volunteers began giving educational presentations in Old Fadama on human rights and relevant legal issues. In May 2013, the project turned a corner with the development of a plan to create a sustainable legal service which would continue to educate the people of Old Fadama about their rights, and also give them the opportunity to enforce these rights. 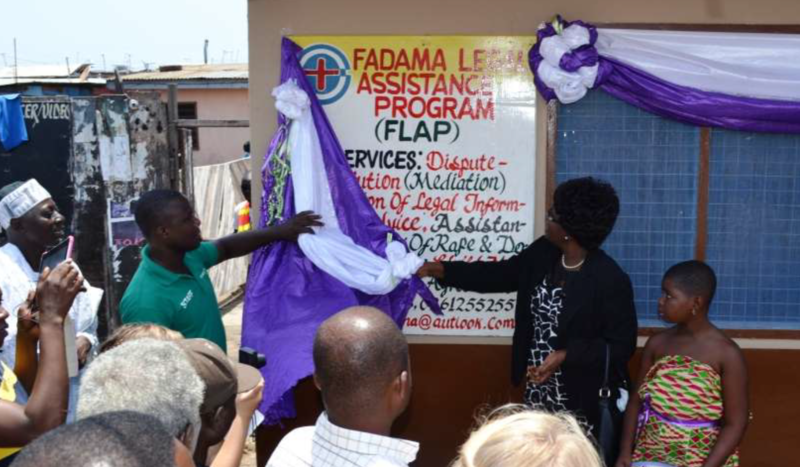 The service was given the name ‘Fadama Legal Assistance Program’. Funded by donations, a fully equipped legal office was erected in the heart of Old Fadama and officially opened by Her Ladyship Justice Rebecca Sittie on 19 September 2013. At its opening, the Centre received much support from the local community, including from the Chief Justice of the Supreme Court of Ghana, Her Ladyship Chief Justice Georgina Theodora Wood. At the official opening, Her Ladyship Justice Rebecca Sittie said, “Every nation owes a duty to its people to ensure that its citizens have equal access to justice and also the protection of their Human Rights”. Today, the Fadama Legal Assistance Program office is staffed by Old Fadama residents who have been trained in human rights, the legal system of Ghana, and the skills of mediation. They are given assistance and guidance by members of the legal profession, as well as international volunteers.